Call for Papers: IIENetworker Fall 2015 Issue, "The Impact of International Education"
The spring 2015 IIENetworker magazine, "Supporting Higher Education During Crisis and Recovery," is now available as a free interactive flipbook. 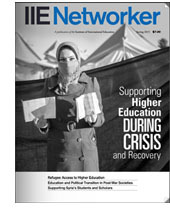 This special edition of IIENetworker shares innovative ideas and responses by several organizations concerned with supporting higher education during and after conflict and other crises—from U.S. scholarships for higher education among refugees around the world to rebuilding higher education in Afghanistan, Libya, and a transitioning Myanmar. We hope that this information will lead to lessons learned, best practices, new data and information, and, most important of all, new responses to help students and scholars in crisis and conflict. What exactly does international education accomplish? As advocates for and enablers of international education, it can be helpful for us to step back and take a fresh look at our collective work. This "show me" issue of IIENetworker magazine will collect and examine available evidence to shed new light on the relevance and impact of international education. We hope this process will also raise new questions about the role international education plays, can play, and should play in our future. Article submissions should focus on a central aim of international education and present concrete evidence showing precisely how international education does or does not achieve this aim. We welcome macro- or micro-level discussions, either based on research, a case study, or a compelling story. We would like the magazine to evaluate the core aims of international education, but we also encourage out-of-the-box thinking about why we do this work. If you are interested in submitting an article for the fall 2015 issue of IIENetworker, please address all inquiries to Jon Grosh at jgrosh@iie.org. Submissions are due by May 15, 2015. 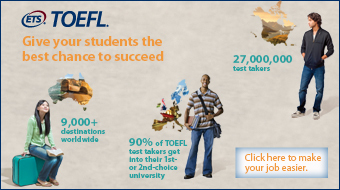 For more information on IIENetworker, please visit: www.iie.org/iienetworker. This job opening is based in IIE’s office in Washington, DC. The position will lead IIE’s efforts to track and pursue new business opportunities with USAID and other international development donors. The successful candidate will manage and coordinate all aspects of proposal development for proposals to USAID, including under the FORECAST II IQC and in other sectors related to higher education, professional training, workforce and youth development and economic growth. S/he will also identify and pursue opportunities with other international development sector funders (including DFID, World Bank, ADB, and Ausaid) and lead proposal development with them. While IIE has been engaged with higher education in India for over 60 years, the New Delhi office was registered in 2005—making 2015 the 10th anniversary of IIE in India. A year-long campaign has been planned to commemorate this milestone and to reach out to partners, donors and supporters. A "10 years: 10 stories" series has been launched to demonstrate impact of our program participants over the last ten years. The first impact story highlights Kanika Bansal and her journey from GE Scholar to innovator. What's Keeping Black Students From Studying Abroad? Why Are All of the Kids on my Study Abroad Trip White? March 24th, 4:00 PM—Update on Key Trends in U.S. Higher Education (Rajika Bhandari, Deputy Vice President, Research & Evaluation). March 25th, 9:00 AM—Asia as the Next Higher Education Destination? Intra-regional and Inter-regional Student Mobility (Rajika Bhandari, Ola Mahmoud, Research Officer, and Paul Turner, Regional Director for East Asia). March 25th, 4:00 PM—National Strategies to Enhance Outbound Mobility: Case Studies of Germany, Japan, and the U.S. (Rajika Bhandari). March 26th, 9:00 AM—Building Sustainable Asia-to-Asia Institutional Partnerships: Criteria, Configurations, and Case Studies (Diana Kartika Jahja, Executive Director, Indonesian International Educational Foundation (IIEF), Clare Banks, Assistant Director, International Partnerships and IIE Initiatives, Jonathan Lembright, Director for Southeast Asia, and Namrata Jha, Director, IIE-India). IIE will also be holding an Asia launch of a new publication, Asia: The Next Higher Education Superpower? Edited by Rajika Bhandari and Alessia Lefébure, this publication critically examines the local and global trends driving higher education policies in Asia and their impact on the local and regional knowledge economies. IIE will be co-hosting a book launch event with EducationUSA at the EducationUSA booth (numbers C28, C29, C34, C35) from 12:30–2:00 PM on March 25th. The publication will also be sold at the IIE booth. If you are attending APAIE, please feel free to stop by the IIE booth to meet IIE staff members and learn more about the work we do in Asia and worldwide. The annual EducationUSA Forum gives higher education professionals an opportunity to engage with the global EducationUSA network. Take advantage of the many opportunities to network with approximately 50 advisers from around the world, 14 regional educational advising coordinators (REACs), and U.S. State Department and IIE EducationUSA staff as they present latest regional and country-specific trends and tips for strategic international recruitment planning. The All Children Reading: A Grand Challenge for Development partners (USAID, World Vision, and the Australian Government) are accepting submissions for their "Technology to Support Education in Crises and Conflict Settings" Ideation Prize. This challenge seeks ideas for innovative, technology-enabled approaches for children to maintain access to basic education in crisis or conflict situations, specifically a health crisis, natural disaster, or conflict zones. The USD 50,000 prize is being conducted in partnership with UNHCR and the Norwegian Agency for Development Corporation (NORAD). May 1, 2015 | Register Today! On October 1-2, 2015, the inaugural IIE Summit will bring together Generation Study Abroad commitment partners in Washington, D.C. to highlight their progress and create positive new solutions. The Summit will feature high-level plenary debates, action-oriented sessions, think tanks and networking opportunities, as well as an engaging expo hall, to mobilize commitments and inspire new actions. The Embassies of Brazil, New Zealand, Norway and the United Kingdom will host networking receptions for the conference participants. The Summit will bring together hundreds of participants and speakers, including senior level leaders from diverse sectors. Summit participants will include U.S. and non-U.S. higher education institutions, the K-12 community, foreign language community, study abroad organizations, education associations, private sector corporations and foundations, student ambassadors, the U.S. Department of State and other U.S. government agencies; and foreign government partners, including Ministries of Higher Education and Human Resource Development. 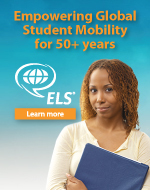 CIEE and Mobility International USA are partnering to give more U.S. college students with disabilities the chance to study abroad. To celebrate the 25th anniversary of the Americans with Disabilities Act, 25 scholarships are being offered to CIEE study abroad programs: 20 to its four-week summer programs and 5 to its fall or spring Open Campus programs at the new Global Institute – Berlin. These scholarships are part of CIEE’s commitment to the Institute of International Education’s Generation Study Abroad™ initiative, which aims to double the number of U.S. students studying abroad by 2020. Developed by the education abroad field, the Education Abroad Standards offer authoritative and comprehensive guidelines for the development, management, assessment and improvement of education abroad programming in order to make the experience as rewarding and meaningful as possible for students. "The old adage ‘don't leave home without it’ is surely true for this set of guidelines," said IIE President and CEO Allan Goodman. "The Standards that The Forum promotes and the advice it gives assures us all that when making international a part of your education, it will be a safe and high quality experience." © 2019 Institute of International Education. All rights reserved.